Microeconomics - individuals' choices of where to live and work, how much to save, what to buy, and firms' decisions about location, hiring, firing, and investment - involves issues that concern us on a daily basis. But when people think about economics, they tend to place importance on the bigger picture - macroeconomics - including issues such as unemployment, inflation, and the competitiveness of nations. 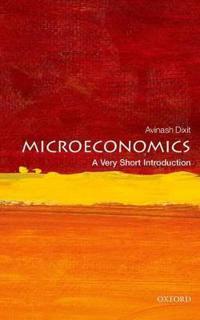 In this Very Short Introduction, Avinash Dixit argues that the microeconomy has a large impact on the economic world, arguably as much as the issues of macroeconomics. Dixit steers a clear path through the huge number of issues related to microeconomics, explaining what happens when things go well, as well as showing how they fail, why that happens, and what can be done about it. Using real-life examples from around the world, using the minimum of mathematics and including simple graphs, he provides insights into economics from psychology and sociology to explain economic behaviour and rational choice. An ideal introduction for anyone interested in business and economics.ABOUT THE SERIES: The Very Short Introductions series from Oxford University Press contains hundreds of titles in almost every subject area. These pocket-sized books are the perfect way to get ahead in a new subject quickly. Our expert authors combine facts, analysis, perspective, new ideas, and enthusiasm to make interesting and challenging topics highly readable.